As you get older, certain changes occur in the body such as joint stiffness, loss of muscle, and some loss of energy. Physical stresses build up over time as well as an inability to recover as quickly from falls or other accidents, and this can lead to excessive wear on the discs in the spine. This is known as Spondylosis or Degenerative Disc Disease and this condition is a major cause of chronic low back pain. Because the discs in the spine do not have a dedicated blood supply, the discs must rely on a process called imbibition to receive their supply of water, nutrients, and oxygen. If the flow of these elements is disrupted, the vertebral discs can degenerate. This degeneration can cause the disc to bulge and pinch (impinge) surrounding nerve roots, thereby causing pain in the back or the neck and the arm or leg depending where this happens. Nearly everyone will develop some disc wear as they get older but it does not necessarily mean that you are going to get pain from this. Interestingly, studies have shown that up to 65% of the population have degenerative changes but have no symptoms at all. It seems that pain levels rather depend on the sensitivity of the self-protective mechanism that the body uses by sending the back or neck muscles into spasm to better protect the disc. Unfortunately, this process can often become exaggerated, leading to a cycle of decreased function, decreased flexibility, and more pain. This is more common in an aging population, however, it can happen in younger patients especially if there has been previous trauma or injury to the disc. The most common symptom is sciatica if in the low back or radiating pain into the arm if in the neck. Low back pain or neck pain may also be present but not in all cases. Often this appears as acute episodes that are intermittent, generally unpredictable and occur a few times per month or year but tend to get worse with time and eventually become constant. Usually larger prolapses and extrusions are more likely to give pins and needles, numbness and weakness in the arm or leg. Although very rare, a complete herniation may cause paralysis of the foot and leg and loss of control of the bladder and bowel. 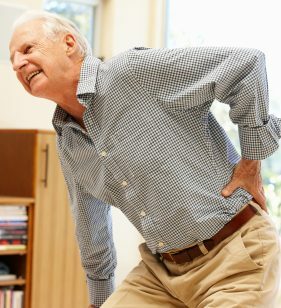 However, there is huge variability in symptoms and it is possible that degenerative disc disease can give absolutely no symptoms at all or can give varying degrees of leg and low back pain ranging from intermittent ‘grumbly’ pain to absolute agony with or without pins and needles, numbness and weakness in the arm or leg. If the pain is located just in the back and into the buttocks or in the neck and into the shoulder, it may be due to facet syndrome but often the two conditions occur simultaneously. If you’re suffering from degenerative disc disease, it’s important to receive a skilled assessment and diagnosis by an experienced osteopath. Although it is not possible to undo the wear and tear on the disc it is entirely possible to relax the surrounding muscles to break the pain-spasm-pain cycle as well as changing the abnormal loading on the disc to reduce the sensitivity of the self-protective mechanism and prevent painful episodes. Osteopathic treatment is aimed at releasing the strains and stresses that have accumulated in the body over many years. It also acts to improve the blood flow to all parts of the body and can promote muscle relaxation. This not only reduces the pain and stiffness but also decreases compression strains acting on the disc, potentially slowing any further degeneration considerably. However, it does take some time and often requires between 4-6 treatments to get rid of the pain – and longer to allow the strain to be kept away from the degenerative disc. This treatment is very gentle and, along with lifestyle and exercise advice, outcomes are usually very good. Patients are seldom disappointed as they are shown that suffering pain, stiffness and poor health are NOT an inevitable part of getting older and many people in retirement could and should be able to resume an active lifestyle. Medication prescribed by your GP can often help with the acute pain, but can have quite nasty side effects and can be addictive. Also, medication only addresses your symptoms and will do nothing about the underlying injury process, meaning that there is a risk of this recurring again if not managed with appropriate treatment and advice. Your GP will probably refer you for a steroid injection for which you may have to wait quite a long time. In addition, steroid injections do not address the underlying condition but just bathe the area with a strong anti-inflammatory to help with the pain. The pain often returns, but if it stays away for 3 months it is less likely to. However, the underlying problem still remains and without some form of rehabilitation there is a large risk of recurrence. For cases such as these, we have had great success using IDD Therapy spinal decompression. The Sussex Back Pain Clinic specialises in the non-surgical treatment of Degenerative Disc Disease in both the neck and low back via IDD Therapy, the latest non-surgical spinal decompression technology from the USA. Previous to this technology this was not possible but we now have the expertise and experience to use this, alongside effective rehabilitative strategies, to achieve great long term results for patients who have suffered from months of pain and have either had too long a wait for an injection or previous injections have not worked for them. We’ve been able to help many patients more effectively manage this condition and return to an active lifestyle.